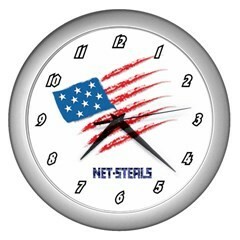 These wall clocks are perfect for a home, business, shop, or for a gift. It measures 10" in diameter. Silver plastic frame with a plastic face cover. Requires 1 AA battery (not included). Winning buyer to pay $8.50 shipping to anywhere within U.S. Canada or outside of U.S, the shipping will be $19.95. Payment is expected and required to be received within 48 hours and forms of payment accepted are by Paypal in US Dollars only.